The “healthy home plan” in question revolves around indoor air quality, or “IAQ.” According to the Consumer Public Safety Commission, “the air within homes and other buildings can be more seriously polluted than the outdoor air in even the largest and most industrialized cities.” Why? Mostly because natural gas stoves release fine particles of nitrogen dioxide and carbon dioxide — compounds that are heavily regulated by the EPA when they’re released by fuel-burning cars — whenever they’re used. Electric stoves release pollution to a lesser extent. Most surprisingly, just the act of combustion in cooking produces pollution, and it even leads to more noticeable issues like excess moisture, foul odors, and grease buildup. This Old House’s fourth-annual “Idea House” kitchen spotlights the WhisperHood. The project aims to provide the multiplatform brand’s audience “with fresh takeaways, innovative products, and how-to instruction that home enthusiasts can incorporate into their own remodels and new-builds.” Construction of the 2,700-square-foot structure began in April 2018 in Narragansett, Rhode Island. The entire build was captured on a webcam and livestreamed on the This Old House website, and now, the home is being featured in the November/December issue of TOH magazine, as well as in segments of the This Old House TV series. Panasonic Eco Solutions is listed as one of nearly 30 sponsors whose products are included in the house, many of which focus on using advances in technology and design to make homes healthier and more efficient. A lot of people simply don’t bother running their kitchen exhaust because their systems are notoriously noisy, ineffective, or both. 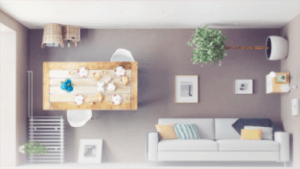 Together, Panasonic and TOH paint a new picture of the kitchen as the “epicenter of your home,” touting the WhisperHood as the ideal solution to quickly clear the air of pollutants caused by cooking. The companies have also placed a lot of emphasis on the hood’s ultra-quiet operation noise, which apparently can’t even compete with the volume of a normal conversation. The wall-mounted, chimney-style hood is incredibly sleek, consisting of stainless steel, minimal lines, a low-profile control panel, and energy-efficient LED lighting. TOH notes that it’s design complements both the modern elements of the Idea Home kitchen and the traditional ones, like the custom-crafted walnut shelves. But how exactly is it innovative? A range hood’s performance is measured in terms of CFM (cubic feet per minute, or how much air the fan can move) and sones, a unit of measurement for loudness. The hood’s HushFlow Technology reportedly allows it to be 86 percent quieter than other hoods — though this is a fairly subjective measurement. Moving air at 390 CFM, its real innovation comes in the form of a “capture efficiency plate.” Simply put, it uses a limited suction area to create more power. You can see this by watching cooking steam being drawn up into the plate. To keep everything clean and tidy, these plates have been designed to be both removable and dishwasher safe. Panasonic’s Ventilation FAQ page literally reveals the nuts and bolts of their reinvention efforts, reading: “tip speed, blower wheel, exhaust outlet, and motor all combine to form a uniquely quiet design. Panasonic fans feature AC and DC four-pole condenser motors. The four-pole design helps the AC motor fan rotate smoothly and evenly. Not only does this mean reduction in noise, [but] it also makes Panasonic motors among the most efficient fan motors around.” The same design enables the fan to operate at a lower RPM (rounds per minute), which reduces its overall energy consumption.